Baby boys never looked more ready for Christmas than in this onesie. The green and white longsleeve onesie has a brown fuzzy applique with red antlers and red nose. There is red trim on the sleeves, neckline and ankles. There is snaps along the inside of the legs to accomodate diaper changes. 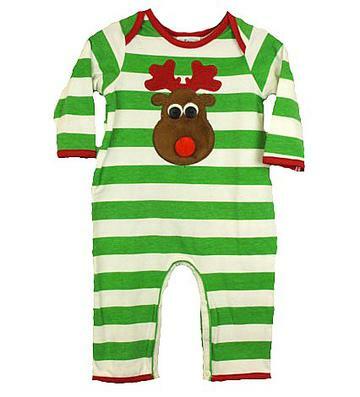 This super soft onesie is 92% cotton and 8% spandex.